“The ONU Holiday Spectacular”7:30 p.m., ONU’s Freed Center for the Performing Arts, Ada. Adults $20, faculty and staff $15, seniors $10, ages 12 and younger $5. 419-772-1900 or wwwfreedcenter.com. Students perform on stage during a rehearsal of Ohio Northern University’s 23rd annual “ONU Holiday Spectacular”. The show will be presented in ONU’s Freed Center for the Performing Arts at 7:30 p.m. on Nov. 16, Nov. 17 and Nov.18, with a matinee performance at 2 p.m. on Nov. 18. It also will be presented at the Lima Veterans Memorial Civic and Convention Center at 7:30 p.m. on Dec. 1 and Dec. 2, with matinee performances at 2 p.m. on Dec. 2 and Dec. 3. ADA — “The ONU Holiday Spectacular” will begin at 7:30 p.m. Nov. 15-17, with a matinee at 2 p.m. Nov. 17 at ONU’s Freed Center for the Performing Arts. Lima shows will begin at 7:30 p.m. Nov. 30 and Dec. 1 with matinees at 2 p.m. Dec. 1 and 2 at Veterans Memorial Civic Center. Tickets for Ada shows at adults $20, faculty and staff $15, seniors $10, and ages 12 and younger $5. Call 419-772-1900 or visit wwwfreedcenter.com. Tickets for Lima shows are $5 and available at the Freed Center and Kewpee Hamburgers. j-jeffery@onu.edu or 740-707-1368 (cell) to arrange a time. ADA – A regional holiday tradition will again take center stage with the 24th edition of Ohio Northern University’s “The ONU Holiday Spectacular” musical extravaganza. The show will be presented in ONU’s Freed Center for the Performing Arts at 7:30 p.m. on Nov. 15, Nov. 16 and Nov.17, with a matinee performance at 2 p.m. on Nov. 17. It also will be presented at the Lima Veterans Memorial Civic and Convention Center at 7:30 p.m. on Nov. 30 and Dec. 1, with matinee performances at 2 p.m. on Dec. 1 and Dec. 2. The fully staged musical revue ushers in the holiday season and includes dancing and singing while showcasing the performance talents of ONU students and area children. “The ONU Holiday Spectacular” features festive carols, lavish sets, ballerinas, toy soldiers and St. Nick himself. It is set in places such as the North Pole, Toyland, Santa’s Workshop and Lima, Ohio. 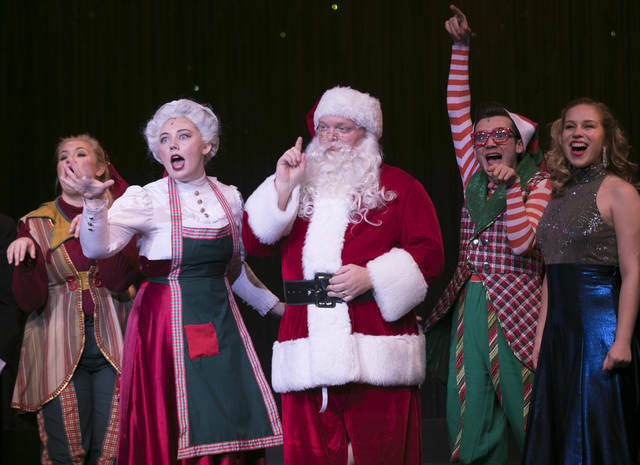 Among the student performers are Raymond Cronley of Oxford, Ohio, as Tinsel; Alie Campbell of Hamilton, Va., as Trixel; Emily Estep of Fresno, Calif., as Angel; Shawn Stevens of Lima, Ohio, as Santa; and Darby Beckwith of Virginia City, Nev., as Mrs. Claus. In all, approximately 80 ONU students and 22 children are part of the cast as singers, dancers and other performers. The performance is under the direction of Kirsten Osbun-Manley, resident artist in music and musical theatre program director at ONU. Gina Wiley, artistic director and owner of The Dancer By Gina in Delphos, Ohio, serves as choreographer, and Michael Jordan, resident artist in the Department of Theatre Arts, is music director. Tickets for the Freed Center performances are $20 for adults, $15 for ONU faculty and staff members, $10 for senior citizens, and $5 for children 12 and under. The Freed Center box office is open Monday through Friday from noon to 5 p.m., and Saturday from 10 a.m. to 2 p.m. Phone orders are accepted with American Express, MasterCard, VISA or Discover by calling 419-772-1900. Tickets also are available online at www.freedcenter.com. All tickets for the Lima performances are for general-admission seating and are available for $5 at all Kewpee Hamburgers locations and at the Freed Center. The show is underwritten in part by the DeBow and Catherine Freed Endowment for the Arts and Kewpee Hamburgers. Marking more than two decades of sponsorship, Harry and Myrna Shutt, the owners of Kewpee Hamburgers, have underwritten “The ONU Holiday Spectacular” since its inception in 1994. They also have funded the expense of moving the performance from Ada to Lima. The Shutts have maintained the price at $5 for the Lima performances to ensure the show is affordable for families. https://www.limaohio.com/wp-content/uploads/sites/54/2018/11/web1_HOLIDDAY-SPECTACULAR-SANTA-AND-OTHERS.jpgStudents perform on stage during a rehearsal of Ohio Northern University’s 23rd annual “ONU Holiday Spectacular”. The show will be presented in ONU’s Freed Center for the Performing Arts at 7:30 p.m. on Nov. 16, Nov. 17 and Nov.18, with a matinee performance at 2 p.m. on Nov. 18. It also will be presented at the Lima Veterans Memorial Civic and Convention Center at 7:30 p.m. on Dec. 1 and Dec. 2, with matinee performances at 2 p.m. on Dec. 2 and Dec. 3. This entry was tagged 111518, 111618, 111718. Bookmark the permalink.